This is a continuation of a previous post detailing how I lost my faith. My previous misgivings about Christianity in high school centered around how other Christians behaved. My first inklings of problems with the Bible came in college when I took classes overviewing the OT and NT. for the first time in my life I heard that both parts of the bible had been written by many, many people. This gave me an odd feeling in my gut as I had just begun getting more involved with the conservative group, The Navigators. I basically put this new knowledge on a back burner and soldiered on. Within the Navigators, I began to study the bible voraciously. I couldn't get enough of it and had so many questions. Unfortunately, I began to notice two things. First, there were many inconsistencies and disturbing stories. Second, no one seemed to be able to adequately answer my questions. I kept getting either, God is so much wiser than us and we just have to trust what his word says, or elaborate intellectual gymnastics to explain what the bible said. However, the care and nurturing from the group helped me to push these nagging thoughts aside and soldier on. As I stated in the first part of this testimony, 23 years ago my husband and I started our life together as committed, conservative evangelical Christians. Our first wake-up call was our send-off from The Navigators. Because we were going into the secular work-world rather than missions or pastorate work where we would have received lots of support in transitioning from college life, we were essentially told, "Nice knowin' ya! Have a great life, oh and since you'll be pulling in a steady paycheck, would you consider financially supporting us in our campus ministry?" The sudden cutoff of all the love and nurturing was jarring. We looked at each other and decided we better find a church. Soldiering on. Now, just so you understand who I am just a little better, I have NEVER enjoyed church. I have always had a terrible time paying attention because I am not an auditory learner and the sermons just went in one ear and out the other. I found the songs, whether the traditional hymns of my youth or the praise and worship of the evangelicals, long, repetitive, and mind-numbing (I wonder if that's actually the hidden purpose of them?). I never felt any emotional response to anything and even wondered if there was something wrong with me as I watched others with their eyes closed and hands in the air appearing in some sort of ecstasy. No matter which church we tried, I was never at ease. We soldiered on. I tried to connect with other women in church groups (there were no mixed groups unless they were for married couples) and was continually frustrated by the lack of depth of discussion and honest questioning. They talked about how to be better wives and mothers and little else. In one church, enough women had expressed concerns about the role of women in the church that the elders (all male) decided to study the issue in depth (using the bible as their only reference) and came to the conclusion that no, there was still no support for women taking leadership roles or teaching mixed classes. Women could teach other women or children and not be elders. We soldiered on. My next epiphany, so to speak, came when I was confronted with my own prejudices during interactions with a Catholic coworker. I realized I knew little about Catholicism and it decided to learn about it. When I decide to learn something, I tend to go all out and read everything I can get my hands on. After months of study I discovered that the Catholics had some things right and the Protestants and some things very wrong. This really surprised me, and I even considered converting to Catholicism for awhile. However, the overemphasis on Mary, extreme wealth of the church (why don't they loot their own cathedrals of all that gold and art and give to the poor they supposedly love so much? ), and weird fixation on celibacy of the priesthood dissuaded me. We soldiered on. The next chapter of our life was probably the beginning of the end, for me at least. We began to try to start a family. Long story (7 years long) short, it wasn't meant to be. Though we eventually adopted two of the most amazing people I have ever had the privilege of knowing, during those seven years I had a secret belief seemingly validated: God does not answer prayers. I had always had a gnawing feeling in my gut that God didn't really care, but I kept trying to convince myself of the oft-repeated sayings that God loves us, wants a personal relationship with us, his ways are higher, has an even better plan for us, etc. But despite all these encouraging things, all I ever seemed to get from him was silence. Swallowing my doubts yet again, we soldiered on. As I got older, I began to sense in myself a dawning awareness of a more liberal bent to my personality. I cared about the environment. I cared about the here-and-now more than the afterlife. I had a heart for the underdog. I didn't believe in the "This is god's country" malarkey (what did that say about all the other countries if only America is god's country, and where in the bible did it say that anyway!). It seemed to me that Jesus fit this liberal bent, but The Church clearly did not, with its emphasis on the primacy of the Word, America, and so-called family values. As a result, I moved toward a stripped-down, Jesus-only faith and soldiered on. As I entered my forties, I began reading books and watching programs on the origins of Christianity and the bible, including scientific/logical explanations for mysteries such as the plagues, why there are multiple versions of the same stories, why the gospels don't match, etc. 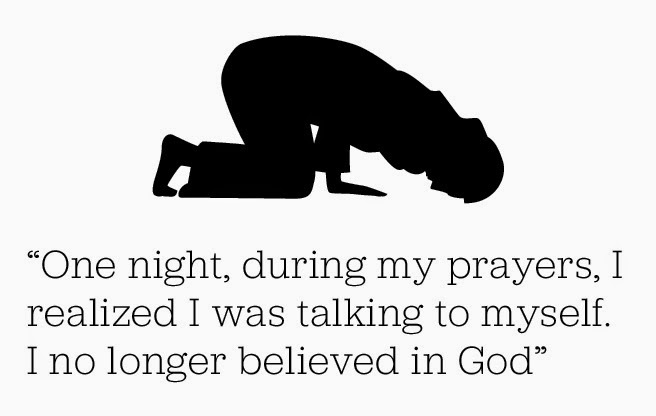 I rarely, if ever, read the bible, prayed only at dinner and kids' bedtime, and went to church for friendships alone. I was saddened and disappointed when the church we were attending at the time chose to raise $2 million to enlarge the building rather than help those in need. Imagine what $2 million could have done! I had all but ceased soldiering on. At the age of 45, my husband told me he no longer felt sure there was a God and had felt that way for many years. The thing that really hit me was when he said he had prayed and asked God repeatedly for years to give him some indication that he was really there and had gotten nothing. There is a verse that states that if you ask, you will receive; if you seek, you will find; if you knock, the door will be opened. How could God fail to respond to the one thing we are told he wants more than anything else: a sincere seeker wanting to know him and believe in him!? I try in a very weak, defeated way to soldier on for another 2 1/2 years. I don't even know why. Then, I ran across a blog post that was the last straw. It seems so silly now, and I can only think that it worked because I was already primed for it, but the blogger likened religion to a belief in Santa Claus. Santa is used by parents to control kids. Be good or Santa won't bring you anything! Religion is used the same way. Believe in God or you won't get to heaven! It just suddenly crystallized in my mind. Religion is a form of control. It's all an elaborate lie, begun long ago, to explain nature and control others. Instantly I felt an overwhelming sense of relief and peace, nothing like the "peace" I was supposed to have felt as a believer. I also felt anger and frustration that it took me this long to get it! The indoctrination is deep and thorough it boggles the mind! I'm not as angry now as I was, because I believe that every day is a new day and you kind of have a chance to start over a little each day. I am thankful that I am not alone in this, though my husband's thoughts run a little differently than mine and may take some working out. I'm just thankful that we came to this before our kids got too indoctrinated. They're 9 and 10 and I love that we can still "save" them!